This type is also known as adsorption type dehumidifiers. The technology used in these models is absorbing the moisture co ntent using an adsorbent such as silica gel. These are very light weight and portable models and are the smallest in the desiccant series. These models have electronic volume control, which functions automatically based on the requirement of dry air. A hygrostat controls the machine for setting desired levels of humidity. Operating range of TTR200 is 0 to 100% RH. / -15 °C to +35 °C. Dehumidification performance is 0.35 kg/h. Air flow rate is 40 – 120m³/hour. Easy replacement of filter is possible without dismantling the equipment. Typical applications will be for small warehouses, cold rooms etc. 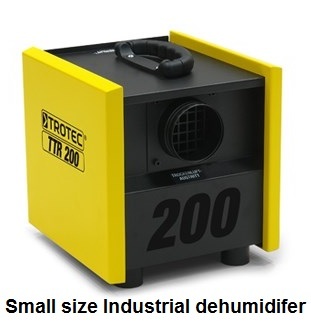 Total weight of this desiccant dehumidifier is only 9 kg which makes it easy for handling and relocating. A hose can be connected to an air output. Other models in this series are TTR 300, TTR 400,TTR D, TTR 500 D & TTR 160. 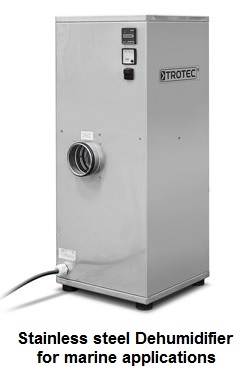 This model of desiccant dehumidifier has a radial fan and an additional motor to pump air over long distances. This makes it ideal for applications in a ship and other marine environments. Marine dehumidifiers require high performance in harsh environments. Operating range is from 0 to 100% RH. and -20 °C to +35 °C. Dehumidification capacity is 1 kg per hour. Air flow rate is from 40 to 120m³/h. Nominal air volume is 100 m³ per hour. Typical applications will be in ships, seaside warehouses etc.etc. The air flow over a long distance is possible by changing the hose connection properly. The marine dehumidifier can connect to a long distance of flexible hose so that the processed air can be taken to longer distances. Other models in stainless steel models are TTR 250 & TTR 250Ex. 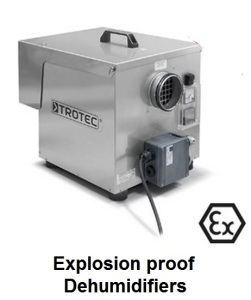 EX models are explosion proof models. This model of desiccant dehumidifier is for explosion proof environment and the model complies to Ex protection class ATEX zone 22 (Ex II 3D Ex c T240 °C) . Operating range of TTR 250EX is from 0 to 100% RH and -20 °C to +35 °C. Air flow rate is 180 m³ per hour. Dehumidification capacity is 1.1 kg per hour. The weight of the TTR250EX is 21 kg. Why cold room & freezers require desiccant dehumidifier? Cold rooms, cold storage, walk-in freezers etc. operate at or below 5 Deg. Centigrade or below zero. Hence the cold rooms always will have high humidity up to 100%. This is because it absorbs humidity from the surrounding area outside the cold room. Hence you will definitely require a cold room dehumidifier to reduce the humidity. A condensation de humidifier works on the principle of condensing the moisture in the air. But when the temperature is low as in a cold storage or freezer, condensation will not happen. This is because the room temperature is below that of the condensation coils. Hence the only option for such rooms is desiccant dehumidifiers only. So if you have to reduce humidity in a cold room or freezer room, you should preferably use a desiccant type only.